Frank Connet says: "Memories of nature form the basis of my art. The rhythms and patterns of a leaf’s radiating lines, the cycles of growth and decay, the confluence of waters and silted sand created by currents are echoed in these cut and pieced textile hangings." His work has been in solo and group exhibitions at such places as Douglas Dawson Gallery (Chicago), Muskegon Museum of Art (Muskegon, MI), and C.G. Jung Institute (Evanston, IL), among many others. 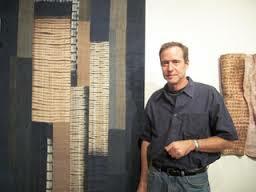 He has work in collections including The Art Institute of Chicago, MacArthur Foundation, and Vedder Price. Connet holds a BFA from Kansas City Art Institute (1983). His studio is in Chicago, Illinois. What adhesive do you use? Members share how they stick their stuff together. Defend your favorite interfacing or glue! Everyone is invited to present their techniques.